It seemed like half the people on my flight from Shanghai to Taiyuan were coughing—short, dry testimonies to the coal city’s infamy as one of the most polluted places in China. Taiyuan deserves that reputation, I saw as I rode a bus from the airport to the train station: a thick yellow haze hung in the air, and everything appeared covered in a permanent coating of dust. But few of the people on the street wore the face masks that have become ubiquitous in Beijing and Shanghai, and I realized that the day’s pollution actually wasn’t that bad, relatively speaking. Blue sky, at least, was visible. I found what seemed to be the shortest line for same-day tickets and joined it, my eyes already dry and burning from the mixture of air pollution and cigarette smoke wafting through the air. Suddenly, a gangly elderly man in a dusty, ill-fitting security uniform was standing next to me, trying to get my attention. “You … go …” he started out, struggling to form a question in English. I quickly intervened. “I can speak Chinese,” I said, and he visibly relaxed, smiling at me. “Pingyao,” I responded, and he nodded and walked away. Pingyao: a small walled city in Shanxi Province, a well-preserved (or in places well-restored) example of life on the northern plain in late imperial China. I meant to go there nine years ago, when I was just an overnight train away in Beijing, but for no particular reason, I never made it. I had virtually forgotten about Pingyao until earlier this month, when I was flipping through my Lonely Planet and saw the city’s entry. There’s no direct route to Pingyao from Shanghai, and trains from Shanghai to Taiyuan take anywhere from 13 to 22 hours, but I found round-trip plane tickets online for $150 and decided that now was as good a time as any to spend a weekend seeing the sights of Pingyao. But first I had to get there. I finally reached the front of the ticket line and pulled out my wallet and passport, ready to speak, when the security guard suddenly reappeared by my side. He’d clearly been watching and waiting for me to get to the window. “Three o’clock has no seats,” the agent immediately returned, not even stopping to check the computer; she’d known that before she asked the question. This was definitely feeling like my memories of the pre-high-speed rail days. 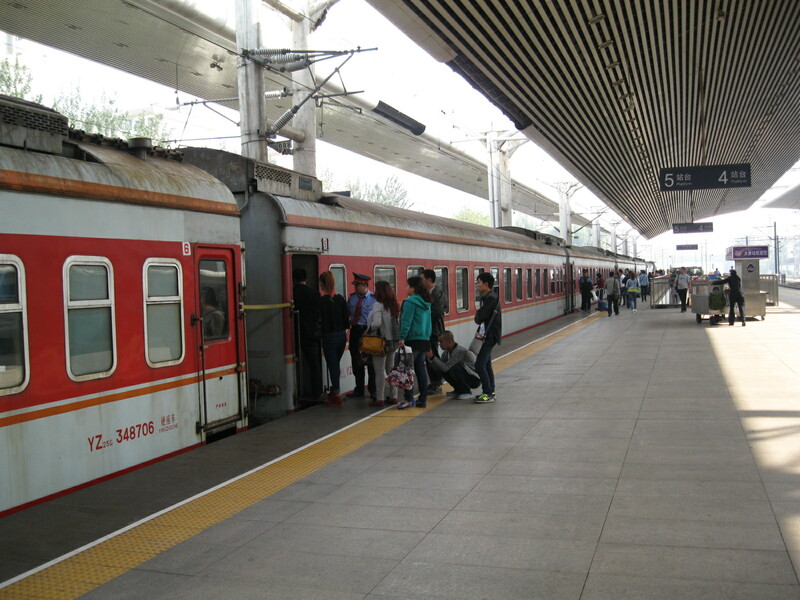 I am bad at buying train tickets under pressure; I could have stayed at the window and asked when the next seat to Pingyao would be available, but I was too conscious of the long line behind me and the security guard watching me and the ticket agent seemingly willing me to vanish. 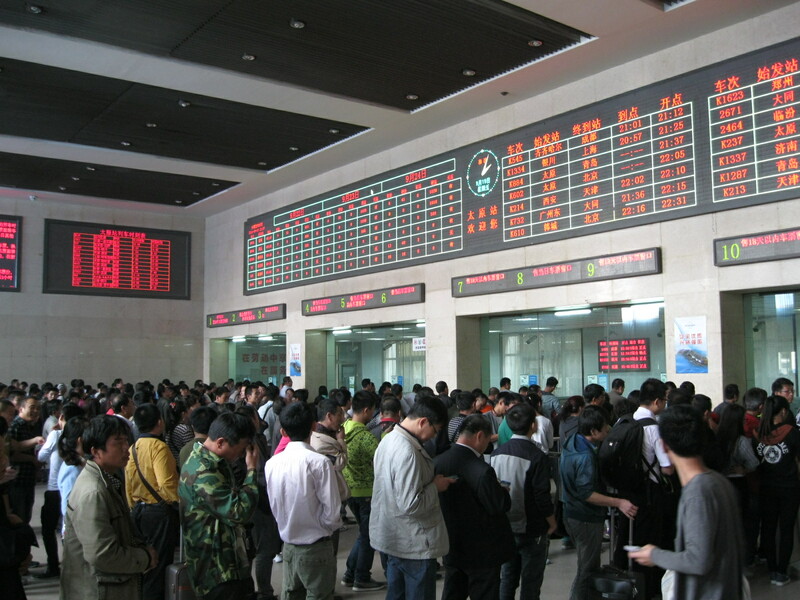 I knew that the trip to Pingyao was just 90 minutes long, and I really didn’t want to sit in the Taiyuan train station all afternoon. I made an instantaneous decision (which is so often the wrong course of action when traveling, in China or anywhere). The ticket agent snatched up my passport and started flipping through it, stopping to examine the visa from a trip to India in 2010. She finally located the information page and bellowed in further annoyance—at the lack of Chinese, I assumed—then leapt out of her chair to consult with another agent a few windows down. I could feel the dozens of people in line behind me wonder why they had picked the queue with the troublesome foreigner in it. The ticket agent finally reappeared and started typing, consulting my passport after every letter as she slowly picked out M-A-U-R-A-E-L-I-Z-A-B-E-T-H, then either didn’t realize that I have a last name, didn’t care, or ran out of space. She got the passport number right, which in my experience is the most important detail, so I decided not to say anything. Shoving my ticket, passport, and change through the window, she waved me away with a sharp flick of her hand, dismissing me from her life forever. I made my way into the grimy train station and ascended two sets of escalators to reach the waiting room level. Knowing from past experience that a standing ticket needs to be accompanied by ice cream or alcohol or both, I stopped at McDonald’s to procure the former and decided I’d get the latter after arriving in Pingyao. I gobbled down an Oreo McFlurry and then joined the endless line of passengers waiting to be allowed onto train 1485, which would begin in Taiyuan and end in Chengdu 27 and a half hours later. Down on the platform, hundreds of passengers ran to locate their assigned carriages and get settled. I wasn’t in any hurry; I knew it wouldn’t do me much good to get on the train earlier, and despite the air pollution, it was a pleasant early-fall afternoon, my favorite time of the year. I lingered on the platform and took a few pictures of the rusty old train. With all the growth of high-speed lines, it seems that China Rail isn’t bothering to keep the previous generation of rolling stock in good condition, though thousands of people still ride those trains every day. At ten to three, I finally wandered down to car 4, showed my ticket to the conductor, and stepped onto the train. Almost immediately, I couldn’t go any farther; they must have sold at least 30 standing tickets per car. The aisle was already filled with passengers, as was the vestibule (the smoking section, I saw), and I squeezed myself into a space next to the conductor’s room at the end of the car, trying to make myself and my backpack small. It didn’t really work, but I couldn’t move anywhere else. The conductor shouted at all of us to clear the aisle, but no one budged and he seemed to realize the futility of his request. Three o’clock came; a bell rang and the train started moving with a lurch that caused all of us standing to grab onto the nearest fixed object. A young woman next to me caught my eye and smiled wryly. “Ai-ya,” she sighed, and I nodded in agreement. I hoped Pingyao would be worth it. 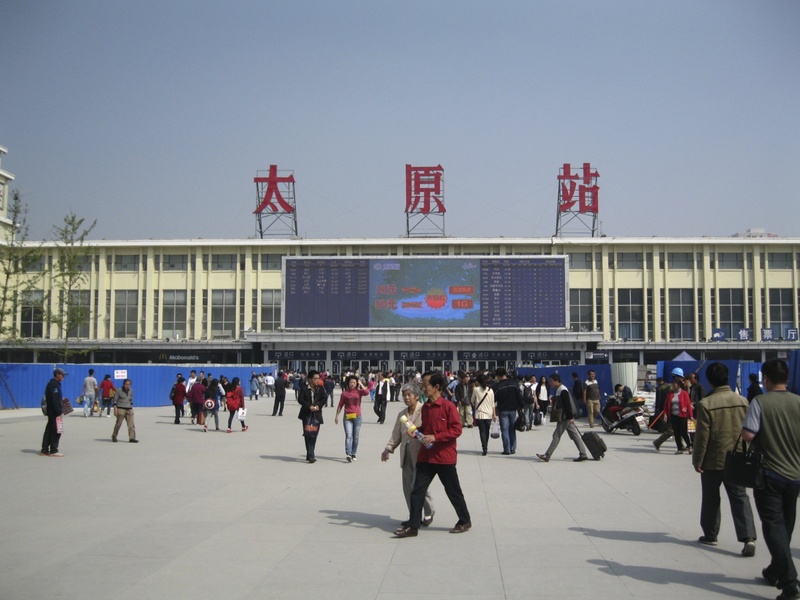 Note: After arriving in Pingyao, I learned that a new high-speed rail station opened up a few months ago; trains from Taiyuan South station cover the distance between the two cities in just about 40 minutes. Needless to say, I took the high-speed train back to Taiyuan on Sunday night, though I still wound up with a standing ticket. My Son visited today. He sent us some great photos. I looked up the pollution index though and Pingyao was in the purple.